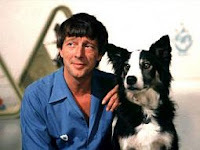 In a development that has left me disproportionately excited, the blog is now located at www.weeblackdug.co.uk, rather than yon electric soup-related address. I am advised by my cyberguru and all round Grand Technological Panjandrum (Gordy) that some keen folk may wish to take the opportunity to update their links. Oh, and there was something about no' having to type www for much longer, but he'd lost me by that point. I hope everybody else is as pleased about this as I am! Absolutely. The links to everybody else's Blogs have disappeared mind you, but that simply means attention will be undivided on mine. If I can't get them back manually I'll give you a shout and you can use your black magic again, eh? < ---------- The links over there? Lol - aye, those ones. I just redid them - obviously the mechanics of their disappearance in the first place is beyond me, but all's weel that ends weel. I noticed you're still having to use www btw. I've configured the A records for your domain with your registrar but the nameservers aren't actually returning those records - reason unknown. Logged a support request for somebody to find oot why. Ooh - I've just forwarded you an email from them. I was feart to open it in case I broke the internet. 95% sure it won't break yer blog, mate. My round if it does, obviously! It really is the full bespoke service you do, isn't it? Worth a pint and a wee hauf, I'd say.